The October flood damage the road near the Thacker house. 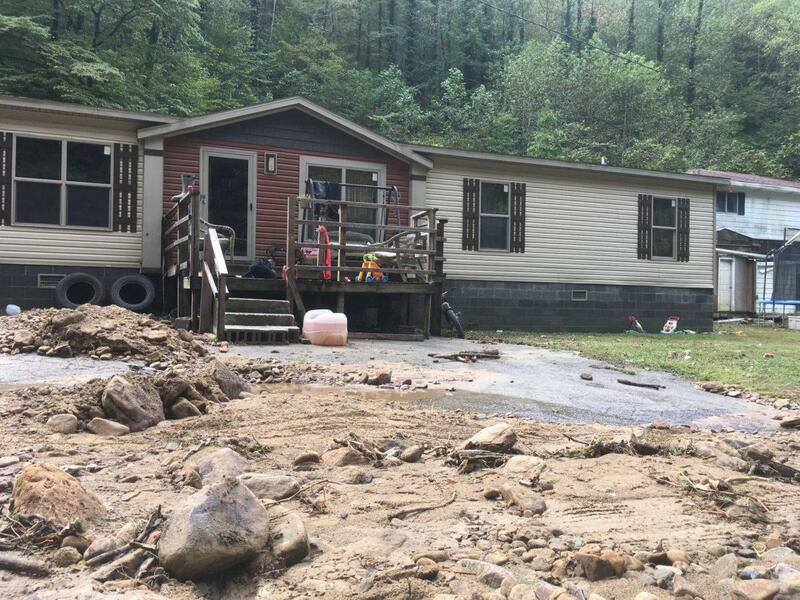 The rain started around 10:30 p.m. By midnight, the creek in front of Elvis and Laura Thackers’ house had swelled to a mighty flood, uprooting trees, moving boulders and surging right up to the couple’s front steps. The Thackers decided to abandon their home. But when they got into their Jeep, they found the flood had washed the road away, leaving them trapped. The couple lay awake most of that night, afraid their whole house would be destroyed. That was October 4th, but it's not the first time the Thackers have faced a situation like this. Debris left by flood waters on the Thackers' property. The Thackers live about a quarter-mile downhill from Bevins Branch, a surface mine formerly owned by West Virginia Gov. Jim Justice and now operated by his children. Justice ran for office on his experience as a coal businessman but has faced criticism for unpaid taxes, failure to pay suppliers, and poorly implementing mine safety requirements. Despite a history of reclamation violations and complaints by residents, Bevins Branch remains the subject of a years-long dispute between the Justice family and regulatory agencies. Originally scheduled to be completely reclaimed by 2015, Bevins Branch remains unfinished. 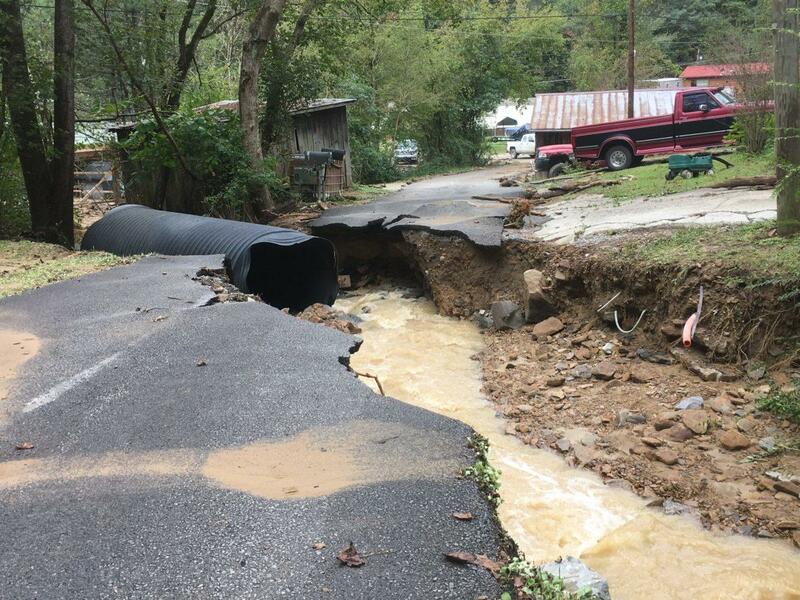 And according to Kentucky’s Energy and Environment Cabinet, households downhill from the mine site have experienced multiple flooding incidents in the past two years in which the state’s inspectors found the Justice family companies were at fault. The Thackers were relieved to find their dog, which they feared had been swept away. In the summer of 2014, the Energy and Environment Cabinet began negotiations with the Justice companies to resolve hundreds of outstanding reclamation violations and civil penalties at the companies’ numerous mines in Kentucky. Those negotiations led to an agreed order between the two parties, in which the Justice companies said they would resolve all outstanding issues by Sept. 1, 2015. A new completion date was set for March 1, 2016. In a report produced for that deadline, state officials said they had “not observed any measurable progress on highwall reclamation” at Bevins Branch. Highwall is an industry term for exposed cliffs that result from surface mining, which can put the environment and public safety at risk. Mine operators are responsible for abating highwall and returning the landscape to its approximate original contours. On June 3, 2016, a heavy rainfall caused a diversion ditch to flood, sending torrents of water and debris rushing towards the Thackers’ house. That flood caused an estimated $148,000 in damage to the Thackers’ property alone. More than two years later, Bevins Branch remains an active point of contention between the Justice companies and the state. The Energy and Environment Cabinet issued two violations in response to the October flood. Those violations required the Justice companies to complete on- and off-site cleanup work or risk a daily fine of $1,500. According to cabinet spokesperson John Mura, the company had begun work onsite, but had not helped restore damage downstream. “We are anxious for the company to complete its work,” Mura said. Richard Getty, a lawyer for the Justice companies, disputed the state's finding that Bevins Branch had anything to do with the flooding downhill. The term “act of God” carries particular weight in Appalachia, where in 1972 a Logan County, West Virginia, coal-waste dam on Buffalo Creek collapsed, killing 125 people and leaving thousands homeless. Inspectors found Pittston Coal Company, which owned the site, responsible for the disaster. But in legal filings, the coal company called the incident an “act of God” for which they could not be held responsible. Getty added that the Justice family companies purchased Bevins Branch out of bankruptcy and inherited 504 violations from the previous owners. At the time of purchase, Getty said, there had been 40,000 feet of unreclaimed highwall at Bevins Branch. “Today, because of our ongoing efforts to clean these things up over the last several years, there is less than 2,000 remaining feet. I think it’s actually about 1,600 feet,” he said. Billy Shelton, another Justice attorney, added that the Justice companies had challenged the state for what Shelton believed to be a wrongly issued citation. 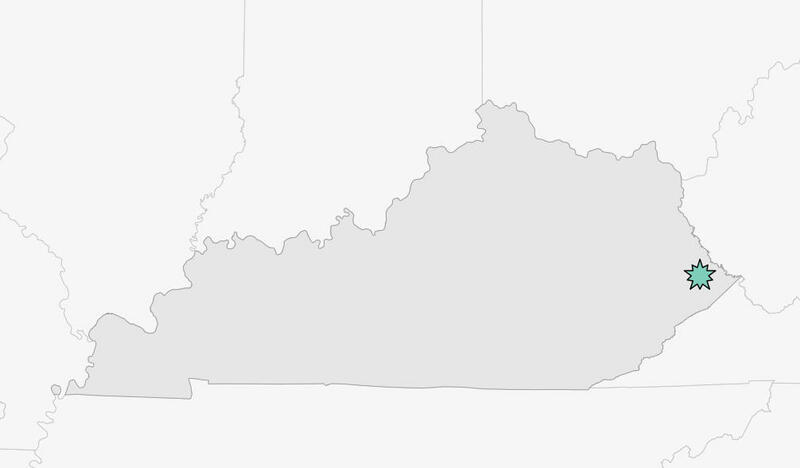 This comes after a 2017 lawsuit against Kentucky regulators for attempting to collect fines that the Justice companies argued were an overstep by the government into corporate affairs. The daily penalty of $1,500 is a drop in the bucket compared to the $2.9 million the state says the Justice companies owe in reclamation penalties. Getty added that the Justice companies don’t believe they’re responsible for that amount. This state inspection image shows a failure of a water diversion ditch on the Bevins Branch mine. The Justice companies blamed the October flood on an an “extraordinary” rain event. But state inspection records place the blame squarely on the poor reclamation of the mine land. “Mining activities have adversely impacted the hydrologic balance,” an inspector wrote. 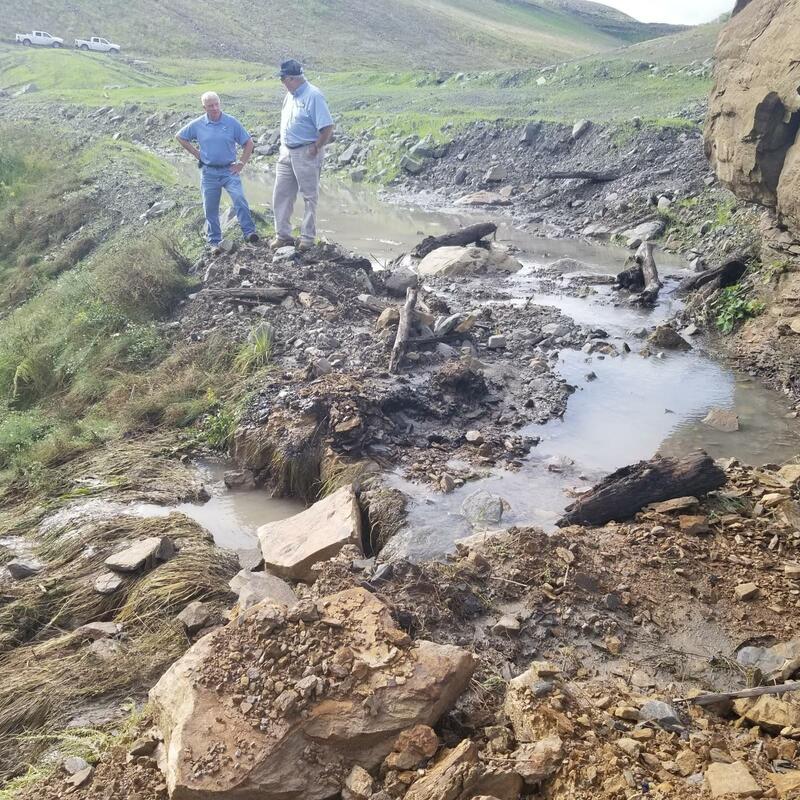 By allowing diversion ditches to fill up with sediment and debris, the inspector concluded, the mining company caused an “uncontrolled discharge” of water runoff. The process of surface mining alters the contours of mountains, disturbs ecosystems and can increase the likelihood of landslides. Kentucky law requires mine operators to restore mountains to their original contour and reseed the land with native plants after mining is complete. “What we typically find is, most of the topsoil is already destroyed and buried in valley fills, leaving only rocks and clay and dirt on the mine site,” White said. More recent inspection reports show that similar issues persist. Getty, the attorney for the Justice companies, says his client has made significant progress in addressing violations that had been inherited from the site’s previous owners. “I believe the Justice companies should be applauded for all of this continuous efforts,” Getty said. Betty Short is 81 years old. She lives alone in a brown house not far from the Thackers, across the road from the mouth of the hollow. In the 2016 flood, thick mud covered every inch of her property. Short slipped when she left the house in the morning, breaking her collarbone. Short said she got a lawyer, but had seen no money for her injury. This time, Short was unharmed, and she didn’t think her house had sustained damage. Already she was making the best of the situation. “At least this time I know to stay out of the mud,” she laughed. 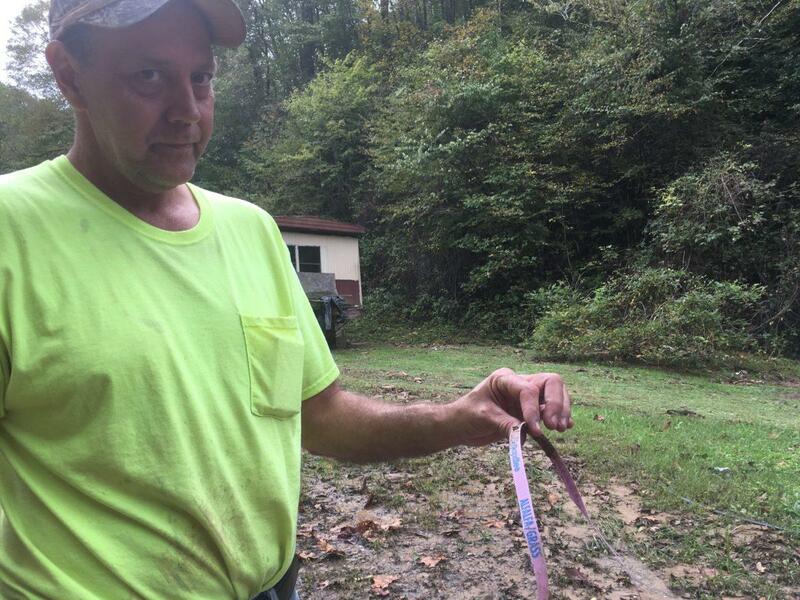 Elvis Thacker holds material swept down from the neighboring mine. Elvis Thacker said he worried about what might happen, too. He and Laura Thacker had even considering moving so they no longer feel afraid when it rains. The federal Office of Surface Mining, Reclamation and Enforcement on October 13 issued a violation of its own against Kentucky Fuel: an imminent harm cessation order. OSMRE spokesperson Chris Holmes said that since the cessation order was issued, Kentucky Fuel had moved equipment to Bevins Branch and begun repairing the diversion ditch. Kentucky Fuel is now accruing $1,500 in state fines every day that it does not complete the required reclamation work. If the work remains incomplete after November fifth, state officials will likely take the company to court -- again. A review of records by NPR and the Ohio Valley ReSource shows that his coal companies owe more than $12 million in overdue county, state, and federal taxes, as well as over $2 million for mine safety violations. Add a lengthy list of environmental violations and damaged mine sites, and a pattern emerges: Justice’s business liabilities have in many cases become public liabilities, and the costs often fall hardest on already cash-strapped communities in the Appalachian coalfields. Listen to the latest story from the Ohio Valley ReSource's Brittany Patterson and Jeff Young. An area roughly the size of Delaware has been mined for coal in Appalachia using mountaintop removal, according to a new study published in the journal PLOS ONE. Researchers from Duke University and nonprofit organizations SkyTruth and Appalachian Voices developed an open-source mapping tool drawing on satellite imagery. The new data show the amount of land disturbed by mountaintop removal mining across Kentucky, Tennessee, Virginia, and West Virginia between 1985-2015. Brittany Patterson reports on a new study that provides a big picture view of the mining’s impact.